Geissele triggers are highly regarded by high power and service rifle AR shooters. 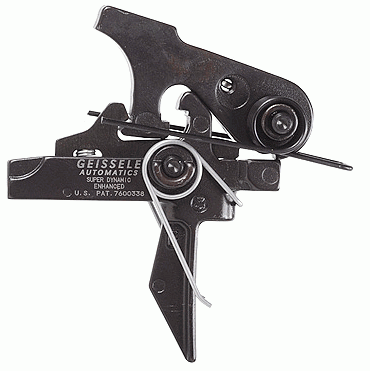 Now there is a new line of moderately-priced Geissele triggers, sold exclusively by MidwayUSA. Geissele will produce three types of Super-Dynamic triggers for MidwayUSA: Combat, Enhanced, and 3-Gun. These will all boast tool steel hammers and precise, Wire-EDM-cut sear surfaces. The 3-Gun model has a special “short reset” feature to allow quicker shot strings in competition. Unless you’re “running and gunning”, however, you’ll probably prefer the “Enhanced trigger”, which features a 2.2-lb first stage, a 1.2-lb second stage and crisper break. Geissele’s Super-Dynamic triggers feature a straight vertical trigger bow, preferred by many competitors. Geissele claims its HI-SPEED hammer cuts lock time by 50% compared to standard AR hammers. The Combat Trigger features a 2.5 to 3-lb first stage and a 2-lb second stage. Normal price: $209.99. The Enhanced Trigger has a 2.2-lb first stage, a 1.2-lb second stage and crisper break. Normal price: $224.99. The 3-Gun Trigger was designed with input from competitive multi-gun shooters and features a “hybrid” 3.5-lb pull and shorter reset for rapid target engagement. Normal Price: $234.99. These three Geissele triggers are all marked down this month. The Combat trigger is reduced $21.00 to $188.99. The Enhanced trigger is discounted $25.00 to $199.99, and the 3-Gun trigger is marked down $25.00 to $209.99. Disclosure: MidwayUSA has been a long-term advertiser with this site. Share the post "New Geissele Trigger for ARs — Exclusively at MidwayUSA"
Can’t wait to get them all-thanks Midway for coming up with stuff like this!! !